Synopsis (from the publisher): Rory Mackenzie is juror number seven on a high-profile murder case in her hometown of Ransom River, California. It's a place she vowed never to visit again, after leaving behind its surfeit of regret and misfortune and the specter of a troubled past that threatened to disturb the town's peaceful façade. Brilliant yet guarded, Rory has always felt like an outsider. She retreated into herself when both her career aspirations and her love affair with a childhood friend, undercover cop Seth Colder, were destroyed in a tragic accident. 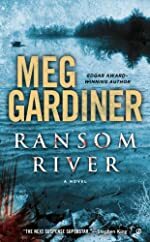 While most of the town is focused on the tense and shocking circumstances of the trial, Rory's return to Ransom River dredges up troubling memories from her childhood that she can no longer ignore. But in the wake of a desperate attack on the courthouse, Rory realizes that exposing these dark skeletons has connected her to an old case that was never solved, and bringing the truth to light just might destroy her.